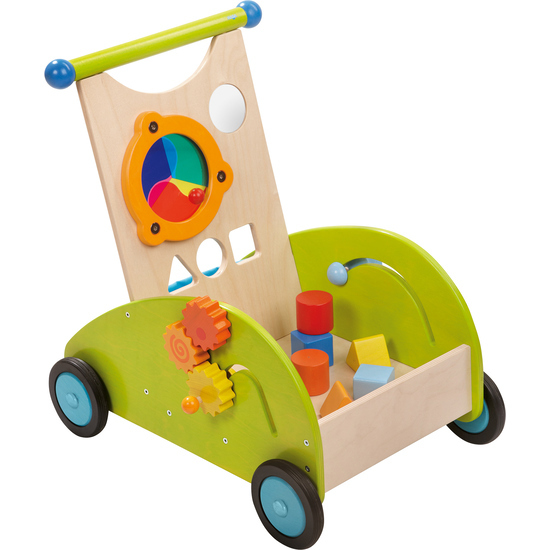 Turning, plugging, and discovering … this walker wagon stimulates little world explorers in many ways. Whoever turns the big disk can watch how the colors change. Which sorting block fits through which hole? By experimenting, little ones discover different shapes in playful ways while the fabric bag on the back collects the blocks. But there are many more things to discover: there is an exciting toothed wheel mechanism and a whizzing rotating element with mirror disk on the sides. And of course, the walker wagon helps with those first steps. Includes six sorting blocks. Brake can be adapted according to individual needs.